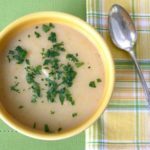 A recipe for homemade potato soup. Potatoes, carrots, onion, and leek are cooked and blended together to make a delicious soup. Peel potatoes and cut into small chunks. Peel carrots and cut into 1/4-inch rounds. Chop onion. Chop leek into small pieces and rinse thoroughly (to remove all grit). Add potatoes, carrots, onion, leek, salt, pepper, and water to a soup pot. Bring to a boil and then reduce heat to low and simmer, loosely covered, for 1 hour or until all vegetables are very soft. Add bouillon to the pot and stir. In a small skillet over medium heat, melt the butter and whisk in the flour. Cook for about 5 minutes to brown slightly. Add mixture to soup pot and stir. Remove soup pot from heat and blend until smooth using a hand blender (immersion blender). Serve and enjoy. Garnish with chopped parsley or green onion.